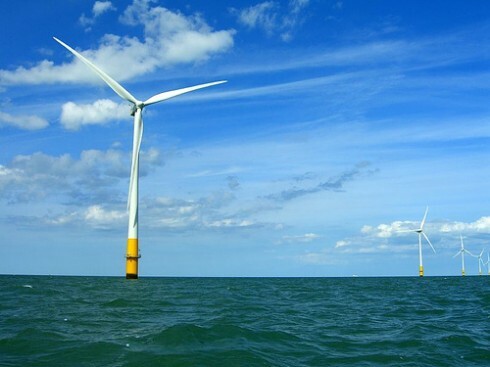 A Cambridge University engineer is urging the wind power industry to look at the designs for offshore wind turbines in an effort to increase their efficiency and decrease the amount of energy required to produce and install the massive towers at sea. Jim Platts of the Institute for Manufacturing at the University of Cambridge believes that the wind power sector could achieve much higher payback ratios if turbines were installed using guyed towers rather than the heavy free-standing towers currently in use. “The development of the wind turbine industry, and the way in which it works with the civil engineers who make the heavy supporting towers and foundations, which are not visible out at sea once the turbines are installed, mean that we have ignored something which is almost embarrassingly obvious in our race to meet the targets set for renewable energy production,” said Platts. The effectiveness of a wind turbine is determined by one key figure: it’s harvesting ratio. This ratio is a measure of the energy it provides compared to the amount of energy required to manufacture the tower. Wind turbines comprise three main elements: the blades that harness the wind energy; the gearbox and generator mechanisms that produce the electricity; the tower that supports these moving parts; and the foundations that hold the tower in place. The tower is conventionally made of steel and the foundation in steel and concrete. A turbine used on land will see two-thirds of the total energy invested to produce the tower embeeded in the moving parts, with the final third invested into the tower structure. Onshore turbines usually achieve a harvesting ratio of 40:1. However, when you situate a turbine offshore, with the need for heavier towers and massive foundations, the harvesting ratio drops to 15:1. “When you look at offshore wind turbines you see a series of slim structures – what you don’t see are the far heavier supporting structures below the surface that they slot into,” said Platts. A preliminary study conducted by the University Institute for Manufacturing suggests that guyed towers could offer significant advantages that conventional heavy towers lack. The use of steel cables fixed to the sea bed by screw anchors could result in significantly slimmer towers and less weighty foundations. The study found that with the resulting reduction in steel and concrete, the harvesting ratio would increase to 25:1. “The use of guyed towers is just the first step for the industry to take. The second step would be to make towers in composite materials which are less energy intensive to make than steel which relies on smelting and concrete that also depends on a chemical reduction process in manufacturing cement. Composites also have a longer life than steel as they stand up to fatigue much better. Using these new materials could increase the harvesting ratio still further to 32:1 and extend the lifetime of a turbine installation from the present 20 years to up to 60 years,” said Platts.